SooJin Lee reviews Joan Kee's Contemporary Korean Art: Tansaekhwa and the Urgency of Method (2013), the first English-language scholarly book on tansaekhwa (‘monochrome painting’), South Korea’s first abstract painting movement. Written by Joan Kee, a leading scholar of contemporary Asian art history, Contemporary Korean Art: Tansaekhwa and the Urgency of Method (2013) is the first English-language scholarly book on tansaekhwa (‘monochrome painting’), South Korea’s first abstract painting movement that emerged and became enmeshed in the country’s national identity programme in the 1960s and 1970s. While tansaekhwa has since remained a controversial strand in Korea’s art history discourses, Kee unpicks and details its exceptional story of establishment, promotion, and reception in Korea and abroad by focusing on particular groups of work that reveal the particular circumstances and ideas that are vital and critical to the understanding of the history of Korea’s modern and contemporary art. This thoroughly researched and richly illustrated book is not just an important contribution to the scholarship and public knowledge on Korean art; Kee’s exemplary method and writing also make it an important reading highly recommended to all art historians. The way she approaches the past and develops it into a convincing history demonstrates a refreshing exemplar of how art-historical research and writing can be done: she interlaces factual information and original arguments with sincere observation, penetrating analysis, and sensitive writing. In fact, tansaekhwa works were often called ‘methods’ (bangbeop, a Korean word that also refers to technique) rather than ‘paintings’ or ‘artworks’. At a time when the strict government’s policies on economic and industrial development and national security intensified, tansaekhwa artists invested much time and labor to produce a work that viewers see as unfinished. Kee argues the paintings reflect the artists’ view of ‘painting as an inverted teleology’ (p 3). In Chapter 1, Kee discusses how Kwon Young-woo (1926–2013) and Yun Hyongkeun (1928–2007) each took up abstraction as a means to explore the then emerging questions of medium, materiality and viewership, and how in so doing they invented new and unique methods of painting. Many painters in postwar Korea who hoped to contemporise art practice and discourse not only eagerly embraced abstraction but also felt the need to challenge the aforementioned Japanese-influenced segregation of ink/Oriental painting from oil/Western painting. In the mid-1960s, Kwon, an ink painter, began to create abstract compositions by cutting, puncturing and covering objects with Korean paper (hanji). 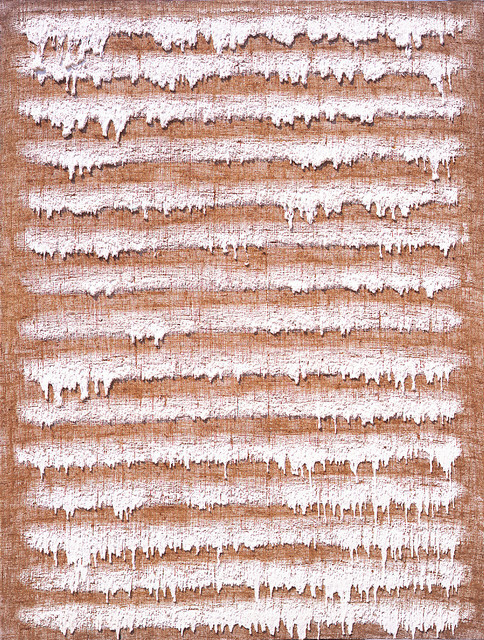 Unlike other ink painters such as Suh Se-ok who practiced abstraction in order to reclaim ink painting and Korean art from what they saw as Japanese influence, Kwon did not reject but utilised the distinctions between different media, producing works that directly demonstrate to the viewers his serious experimentation with paper and its materiality. In contrast, Yun produced work that advanced the possibilities of oil paint’s materiality. As Kee describes, Yun would apply heavily diluted paint on a thick, low-grade canvas usually used for tenting, so that the paint moves and appears like ink on absorbent paper. Such a method allowed him to be disassociated from the then prevalent rhetoric in Korea that characterised abstract painting as mark making. In particular, Kee argues that Yun’s Umber Blue series of the 1970s reveal his intense experimentation with different combinations of pigments and binders – resulting from his consideration of the viewer’s awareness of painting both as a pictorial composition hanging on a wall and as an object existing and partaking in the viewer’s space. Chapter three focuses on the work of Lee Ufan (b 1936), the Korean-Japanese member and the primary theoretician of Mono-ha who played an important role between the Japanese group and Korea’s tansaekhwa artists. In particular, Kee explores his From Line and From Point series (both of which debuted in 1973), paintings comprised respectively of repeated lines or points that he produced by dragging his brush from the canvas’s uppermost edge to the bottom or by pressing the tip of the brush against the canvas until the pigment supply exhausted. Based on extremely detailed descriptions of how the paintings can be experienced by the viewer, Kee interprets them as Lee’s negotiations with place and being placed, especially since he was keenly conscious of his ambiguous identity and that of his viewers in both Japan and Korea – two countries complicated by the thirty-five-year colonial history. For example, though the artist had lived in Japan since 1956, he could not represent Japan in biennales because of his Korean nationality; but in Korea, where he quickly became influential and successful as early as the 1970s, he was still viewed as a Japanese artist and with suspicion. Kee discusses how Lee’s process and technique of mark making, his play with arrangement and scale, together with his professed refusal of ‘making’ and ‘creation’, would set up situations where the viewers can rethink the relationship between subject and object, the questions of power and authority, and their own perception of objects and the material world. Chapter four focuses on Park Seobo (b 1931)’s Écriture series, of which Kee offers an unprecedented political reading. Park began the series in 1973 by marking short, straight lines with a pencil on supports covered with layers of white oil paint. Initially titled Myobop (‘method of drawing’), the Écriture works challenged conventional binaries between abstraction and figuration and between painting and writing. Analysing Park’s mark making as being ‘suspended between the literal enactment of physical presence and its potential function as a means of legible communication’, Kee highlights the ways Park’s paintings may have appeared both physically and visually meaningful to viewers oppressed under the authoritarian government. (p 192) The Écriture series began just a few months after the new president Park Chung-hee declared the Yushin Constitution, which granted him unlimited powers and suppressed civil liberties by practicing intense censorship and monitoring of civil activities, especially of written communication. 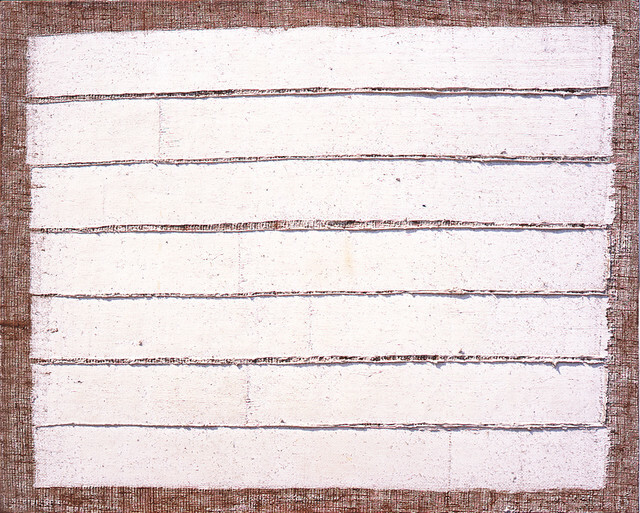 While Park has never made specific reference to the politics – and while tansaekhwa in general has been criticised in Korea for having ignored the political circumstances of the 1970s – Kee closely analyses how Park’s thin, lightly penciled lines, inscribed on painted surfaces, exude a sense of presence and imminence (rather than resistance), inviting the viewer to become aware of his/her presence and ability to see (if not read and write). It is examined that tansaekhwa’s promotion in Japan dangerously yet inevitably involved the rhetoric developed during the colonial era. 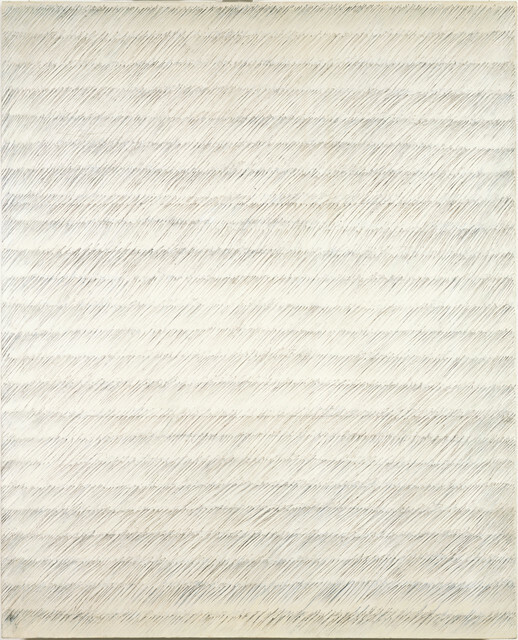 For example, writings of Lee Yil, a Korean art critic and tansaekhwa’s advocate, would emphasise tansaekhwa’s use of white colour and Korean art’s aesthetics of simplicity and imperfection – the characterisations attributed to Yanagi Museyoshi, a Japanese critic who theorised Korean art and culture in the 1940s during the Japanese colonisation of Korea. Exhibitions of tansaekhwa in Japan, such as ‘Five Korean Artists, Five Kinds of White’ (1975) and ‘Korea: Facet of Contemporary Art’ (1977), were actively promoted and well received. But when tansaekhwa debuted in the West, in Paris in 1979, it received no comment in the press, while Korean reporters criticised it for failing to express or promote a distinct Koreanness. Kee’s concluding remarks bring us back to what I highlighted ath the beginning of this review: the importance of her method. As she fruitfully demonstrates throughout the book, a close observation and formal analysis of artworks can be a most faithful and productive method in art history that can bring together form and context. Writing about art, particularly abstract painting, can often be all about giving philosophical meanings to abstract ideas, theories and perceptions – things that are incorporeal. But Kee’s book, through close formal reading, not only gives concrete meanings and corporeal evidence to tansaekhwa paintings, but also reveals untold stories and neglected aspects of tansaekhwa. Especially, her argument and demonstration to connect form and context makes a significant breakthrough in Korean art history discourses. Tansaekhwa has so long and predominantly been viewed as an art for art’s sake that even a major twentieth-century Korean art history survey text would write that the Tansaekhwa movement’s formalism ‘had nothing to do with the reality of Korea at the time’, as if its seeming unconcern with social and political issues was a true fact.1 Counter to such a stereotype about tansaekhwa, Kee’s book offers new perspectives and interpretations, which she presents convincingly and firmly, based on thorough research and close formal analysis. It is not mere coincidence that tansaekhwa has been a strong rising star in the international art market since this book’s publication in 2013. In conjunction with this publication, Kee curated the From All Sides: Tansaekhwa on Abstraction exhibition at Blum & Poe in Los Angeles in 2014, after which the group of artists (Chung Sang-hwa, Ha Chonghyun, Kwon Young-woo, Lee Ufan, Park Seobo, and Yun Hyongkeun) quickly rose to the highest commercial attention of their careers, with blue chip galleries such as Blum & Poe, White Cube, and David Zwirner beginning to exhibit and represent them. Riding on tansaekhwa’s wave of sucess, Korean galleries that have long represented tansaekhwa artists, such as Kukje Gallery and Gallery Hyundai, have recently been focusing on exhibitions not only of tansaekhwa painters but also of their contemporary and next generation of artists. Although the market interest has not so far yet involved or helped spark an intellectual interest in tansaekhwa, the growing worldwide recognition and appreciation of tansaekhwa and contemporary Korean art will continue to prove and understand the tremendous importance of Kee’s book. SooJin Lee is an assistant professor at Hongik University’s Sejong campus in South Korea, where she teaches interdisciplinary courses on art history, cultural studies and media theory. She received a doctorate in Art History from the University of Illinois, Chicago in 2014, and is currently researching on the intersection of art history and consumer culture.